EEC Access Accounts: $40.2 million to support projected caseloads at the Department of Early Education and Care, including maintaining FY14 investments that saw 2,400 new students removed from the waitlist. Birth through Pre-School Expansion: $15 million in additional funding to increase access to high-quality early education programs for 1,700 qualified children from birth to age five. K1 Classroom Grant Program: $2 million for a new grant program available to local partnerships to provide educational opportunities to 4-year olds through the creation of pre-kindergarten classrooms. Preference shall be given to innovative, collaborative proposals jointly proposed by school districts, private providers, human service agencies, and local and regional non-profits. Chapter 70 pre-k funding: $2 million to increase Chapter 70 to fully finance pre-kindergarten costs for school districts who offer pre-kindergarten classrooms. Full-Day Kindergarten: $3.1 million to increase and refocus kindergarten expansion grants to provide communities without full-day kindergarten classrooms the ability to offer such classrooms. In addition, the Department of Early Education and Care administrative line item received a 5.7% increase for staffing needs to enhance program licensing capacity and other functions. The Governor also proposed $2.5 million for information technology costs associated with implementing the state’s Quality Rating and Improvement System. Many early education line items received level funding under the Governor’s plan, including Universal Pre-k, Head Start, Access Management, Mental Health, Services for Infants and Parents, and Reach Out and Read. 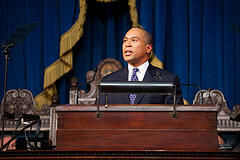 Click here to thank Governor Patrick for supporting early education in the FY15 state budget. Read Strategies for Children’s statement on the Governor’s budget proposal here. The advocacy focus now shifts to the Legislature. Join us on Tuesday, February 4 at 9am for State House Advocacy Day for Early Education & Care and School Age Programs.